Few could argue that this ground has one of the more curious names within the Football League. Getting to Shrewsbury is a fairly easy journey although it seems to take forever to get to the ground once in Shrewsbury. One thing I've always noticed about Gay Meadow is that it's like a yellow pages. Almost every square inch is taken up by an advertising hoarding. There are two possibilites of locations for the away fans to go, either you can go in the terrace behind the goal, or share the seated stand with the home supporters. 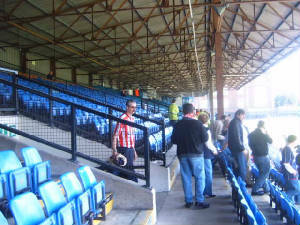 The terracing is not a joy to go in as although it was fairly big, it is also very shallow and even a lot of fans can sound quiet in that stand. The view of the action is also quite poor from this section. 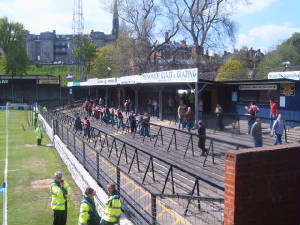 The other possible as stated, is the stand at the side, shared by the home fans and although the view is definatly better than behind the goal, the lack of stewards prevents the Shrewsbury fans just leaning over a small metal gate and taunting the away supporters which could lead to a lot of trouble in the future. The seating in this section also leaves a lot to be desired as it's hard to get comfortable in your seat. 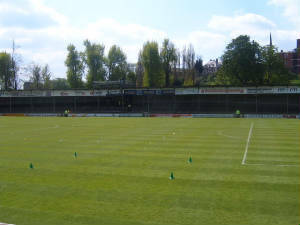 The stand behind the far goal is another terrace, as is the final stand, both of these are similar height and also appears to be near enough the same stand due to the fact that fans can walk around from one side to the other without being stopped or anything. The acoustics at Gay Meadow are quite poor. From the terrace, it's almost impossible to hear the Shrewsbury fans, you may see them singing but you don't be able to hear them, however, in the home stand section, you can hear quite a bit of news coming from there end and often the 2 pitch-length stands sing together, however, their timing is quite poor as they're often at different stages of the same chant to each other. 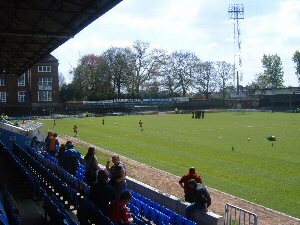 Overall, Shrewsbury's not too bad but there are plenty of things that would make you want to come here for a random game, however, my visits here are over due to the club moving grounds at the end of the 2006/7 season. Fortunately, I went there 4 times and saw City win 4 times so I have fond memories of the ground.